So, Who Do Consumers Trust? Yesterday, we highlighted the findings from Forrester’s latest report on consumer trust. Although there has been quite a bit of discussion on Twitter, on Josh’s comments (read former colleague Peter Kim’s comments) there’s been a mixed bag or reviews from Read Write Web and eWeek. So it’s out in the open: most corporate blogs are trusted, and the reasons are very obvious. First, review this graphic in a separate window, let’s start at the bottom and move our way up. Right above corporate blogs, consumers nearly equally don’t trust social networking site profiles from a company or brand, no surprise, it’s often the equivalent of a corporate blog. Strange that consumers don’t trust personal blogs? We actually saw other findings from data that supports that blogs are not trusted. Then, moving up the graphic, we start to see an increase in trust from mainstream mediums like email from a company or brand, Wikis, radio, mainstream news websites, and print magazines. Finally, you start to see an uptake from social networking profiles of people you know, print newspapers, and then the yellow pages. Perhaps what’s most interesting is that the top three are: Email from people you know, consumer product ratings and review,and search engines. 77% trust email form someone they know. Makes sense, people we know in our truly intimate of circles are those who we keep closest. Websites that have a “Share this via” email may be a good start, using the vendor ShareThis is a good start. Also, this suggests that marketers should start to think about letting other types of content be easily shared from email address to email. We’ve always known that email was the first digital social network that mattered. 60% trust consumer product ratings and reviews: I find both logical but we’ve some ways to go. Right now, we’re leaning on reviews from individuals that may not be in our trust circle. So as the social graph and eCommerce engines start to tie, we’ll soon have access to reviews of products from our direct network of folks we really know. Razorfish has eloquently helped to visualize this concept with this presentation. 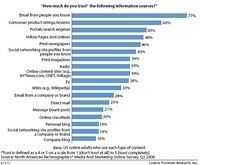 50%: Say they trust portals/search engines: In Google We Trust, is that Charlene Li frequently used to tell me, and it still holds true. When you look closely, the search engine results in Google are really social recommendations. How so? The Google algorithm (while I’m over simplifying) puts a great deal of weight on how humans organize, link, and create content.